Eugene Laverty crashed out of the opening race in Thailand on the Team Go Eleven Ducati V4 R.
Eugene Laverty was left shaken following a high-speed crash during the opening World Superbike race at the Chang International Circuit in Thailand on Saturday. 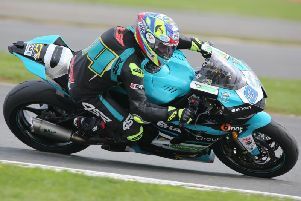 The Toome man suffered a brake issue on his Team Go Eleven Ducati V4 R and was forced to bail off the machine at high speed on the third lap. Laverty, who qualified eighth fastest, said he was fortunate to walk away from the frightening incident. “It’s very disappointing to end race one in this way after such a promising weekend. In Superpole we made a good lap time to qualify in eighth position and I was feeling optimistic of a great result in race one,” Laverty said. “However, on lap three I arrived at the final corner with no front brake. I tried to pump the lever three times but no brake pressure arrived and so I had to jump off the side of the bike.